Published on December 28, 2010 in Recipes. 0 Comments Tags: @sdefino, blackcurrant liqueur, cassis, champage, cocktail, crème de cassis, kir royale, new year's eve cocktial, winobee, www.winobee.com. There is nothing more regal than impressing your New Year’s Eve guests with an elegantly named beverage featuring champagne. 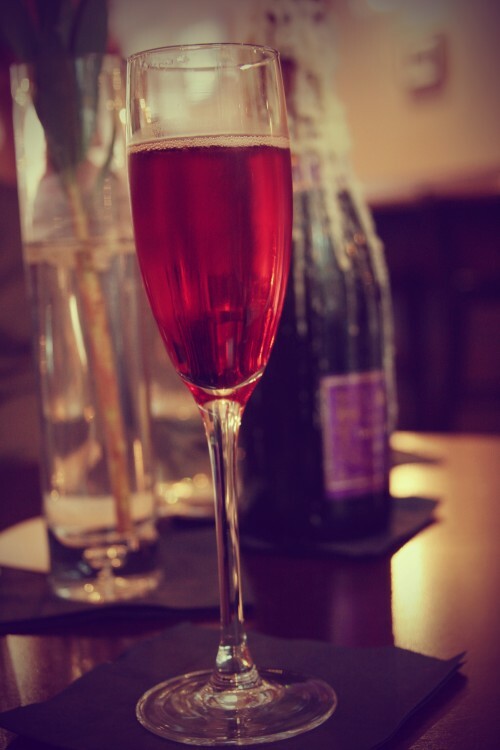 Two words: Kir Royale. This beautiful rose-colored cocktail is a favorite pre-dinner drink among Parisiennes. I first discovered the classic sparkler when I was in college on a trip to Brittany France with our good family friends, who insisted that I move on from drinking Coke and experience this drink with a bit of fresh bread and cheese. Long story short, I’ve been hooked ever since. With New Year’s Eve lurking, let’s be honest, the lingering question of what to sip at midnight leaves many of us notoriously reaching for the finest of French bubbly simply for the fact that it’s “tradition.” But enjoying the holiday hoopla in style doesn’t mean having to break the bank (I mean, aren’t many of our resolutions to “save” in the new year?). Check out some fun, flirty and frugal suggestions from Stacy De Fino at WinoBee, along with her suggested recipe pairings. And if you don’t know about WinoBee yet, be sure to book mark their url (http://www.winobee.com), as it is an up and coming blog which underscores the premise that good wine is often the sign of an even better evening. So happy that WinoBee could kick off this new year with such a relevant guest post! Oh, and if you think you want to Kir Royale it up as we wink at 2011, I’ll give you the secret recipe too, but picking your bubbles is your first step to a successful cocktailing experience. Best value wine offering a delicious sparkle and zest accompanied by a soft, fruit-forward flavor. Combines notes of citrus, pear and floral with a light effervescence that doesn’t overpower the palate. Simply sip as-is or whip up a cocktail using vodka, triple sec and pineapple juice. You’ll love the versatility! Unravel the bubbles of this uncomplicated champagne in a perfect, party-portable size. These 187mL bottles are great for individual consumption (who wants to share anyway?) Simply pack a few in your cooler, grab a straw and bypass the flutes! Softer than champagne, this light wine is made of brachetto and blends rose and raspberry aroma notes with a sweet, appealing touch of berry on the palate. It’s a perfect option to bypass dessert for at your dinner party or to toast with at midnight! This brut cava adds elegance to any soiree. It’s thick Absinthe-green glass and emblazoned solid pewter crest is enough to catch the eye, but the blend of Macabeo, Parellada and Zarello grapes within offer a satisfying fruit intensity and perfumed bouquet. It is recommended to chill your bubbly well — either in a refrigerator for 2 to 3 hours or in an ice bucket for about 30 minutes. For a quick fix you can cool it in the freezer for 30 minutes. Pour Cassis into a champagne flute, then add in the chilled champagne to ensure an even mixture. Their aim is to make wine enlightening rather than intimidating by providing a fun, flirty approach to winos of all levels. Their work has been featured on Redbook, TheSecondGlass.com and Examiner.com.